Well, we did not actually have any flowers in our hair, as the old song goes, but after our three days in NYC and a week in Portland, we did arrive in San Francisco for our next week. We had high expectations - we have both wanted to visit San Francisco, a town with a great reputation in Europe, for a very long time. We were also excited about visiting our friends Alex and Harriet who had been living there for ages. The first thing we noticed about San Francisco is that it is a city of contrasts. We stayed in North Beach around Embarcadero and wanted to see the Mission district, so our first walk was headed there along the Market street. The street is not a pretty place by itself - lots of strange hustling on the streets, people shouting at inanimate objects and the so on. Makes you want to clutch that purse to your body even closer. Alex and Harriet later explained that the valleys tend to be like that, while the hills are prettier. Absolutely true. In all honesty, our first days in San Francisco were slight disappointments when we walked through the valleys but we learned to love it as we walked through other parts of the town. The first (and not the last) coffee in San Francisco was at Réveille Coffee Co. It is a small corner place near where we stayed and we think we got the best coffee of our SF stay there, although their cappuccino size was a bit too big for us. Nevertheless, we did return there for coffee several times. Also on our first day, we splashed out for the fanciest meal of our entire US trip - the shorter tasting menu at Atelier Crenn. What can we say: it was delicious, although the artsy style of the restaurant (the menu has the form of a poem written by Mrs Crenn herself, with each line hinting at one course) may not be for everyone. If you like your burger and fries, look elsewhere. Here we are talking about a series of small dishes in the middle of a big plate, but with flavors fine-tuned to perfection. The next day we had a sightseeing tour of San Francisco in our hostess Paula’s convertible. One word of advice: it is seriously chilly in the back seat even though the weather may look good otherwise. But we did cover the classics: the Golden Gate Bridge, the Seven Sisters, the Presidio, the crooked street at Lombard etc. Although the sights were expectedly touristy, we did love the ride and we loved the fact we did something we would not have done otherwise, and it is also great to get guided by a local: you get to ask anything and get answers you might not have expected. Paula is an experienced guide (witness the California-focused playlist playing through the ride) and now also the owner of arguably the largest private collection of Zuzi’s photos - yes, Paula loves the city and loves taking pictures of her guests enjoying it. Later that day, we went to explore the Mission district. We had a meeting with Alex and Harriet at Four Barrel coffee, which we have known as roasters. The premises are great (former industrial hall with the big roasting pots in the back) but the coffee was not the best we had in SF. But perhaps we just got one of their darker roasts. Didn’t matter. We were there with friends and ready to explore. The Valencia and Mission streets have something Prague lacks in our mind: great retail spaces on the street level, one after the other. It is hard to build a street like these two in Prague because much of the ground floor, especially outside of the centre, is residential. Mission has one restaurant, cafe and shop after another, and you could spend days just trying them all. Harriet decided we had to try everything on the two streets and the surrounding areas. So we went for a bean-to-bar chocolate tasting at Dandelion Chocolate, had headcheese hot dog and chicharrones at 4505 Meats butcher shop, and made the wrong decision and had burritos at La Taqueria. You know it’s not good when you feel you should apologize to your body while you eat a dish. It was popular to the point of being distressing, and we wondered what their food health record was (probably good, it just did not look like it). We had to go to Dosa later for some Indian lentil crepes with vegetable filling and great dipping sauces that night to eat something over it. And to top it off, we went to the most famous place of them all: the Tartine bakery. Of course. Everybody knows the Tartine bread, and SF sourdough is a household name. But what many people don’t know is that when you get to Tartine, your first reaction is “What? Is that it?” Yes, despite the beautiful, tabletop books, Tartine is actually a tiny bakery that is not particularly beautiful. But there is a line outside of the door. Every. Single. Time. We loved their bread. One of the best we’ve ever had and it was pure joy just to spread butter on it from the plastic cup with a plastic knife. It was just so good you did not care. But their pastries are not bad either. We especially liked the banana tarte. How good was it? Zuzi bought the book and now we’re looking for that special occasion to make it. That’s how good it was. We were so full from the evening before, we had to start the next day with a cup of coffee and nothing else. We had it at Sightglass in the SoMa district. After this, Zuzi planned a nice shopping route through the hills, which Jan later lovingly referred to as the “March of Death”. Yup, it was pretty long and demanding, especially given the fact that Jan sacrificed his body for science while tasting… and finishing the pastries at Tartine the previous night. We did visit Craftsman and Wolves for some pastries and some energy refill. We also made our way to The Mill at Divisadero for their famous 4-dollar toast and some coffee and tea. Let’s just say it was NOT the most expensive toast we had during our US stay. But after the march was over (both participants luckily survived), it was time for dinner at State Bird Provisions. We were advised to come early, and what a good piece of advice! We came an hour before the opening time to see a line of some 40 people, the first ones claiming to have waited there for four hours. They brought their own chairs! But we were lucky to get a quick spot one hour after the opening. The concept is genius: a short menu of smaller dishes complemented by small daily specials displayed on carts pushed by some of the waiters. If you are like us, you know how hard it is to say “no” to food, especially when all the waiters could easily pass for “salesmen of the year” in any other venue. And you’re thinking, “Hey, it’s just six dollars!” But when the bill comes at the end, it all adds up. The food was good - we liked their smaller dishes more than the bigger ones (including their staple dish) but the dessert we had was outstanding - lemon curd ice-cream with chocolate meringue and marinated dates. We sadly did not try the dessert milk, which the table next to us proclaimed to be a “game changer” (just like all the other courses that preceded it… just kidding). The next day was Saturday so we visited the farmers’ market at the Ferry Building. A great place that packs lots of things into a relatively small space, with vendors happy to sell you their products in tasting portions. You can make a food tour just there, never leaving the site. We did taste some great olive oils, bread at ACME bread, cheeses by the Cowgirl creamery, sandwiches at Out the Door, and many many other things. We did spend a lot of time there. Next up: SoMa district again and Blue Bottle coffee at the Heath Ceramics site. We liked Blue Bottle basically anywhere we went: you can describe the coffee you like and they will just make one like it. They also use Health Ceramics in Blue Bottle cafes we visited on the West Coast (but not on the East Coast). BTW, Heath Ceramics. Zuzi loved the site and the shop a lot and wanted to buy two things, but then saw a sign for a 20% sale coming up two days later, so we ended up buying six things. Don’t ask, it allegedly makes perfect sense. We did spend lots of time in that cafe. It is nice, airy and has a great atmosphere. After some shopping (with the inclusion of the Tartine bar for their lemon tart, which were too full to try the last time we were there) we ended up at the 4505 Meats BBQ place at Divisadero. This is what a hipster BBQ place should look like: one counter inside and the rest of the tables outside on what probably used to be a parking lot, great meat, lots of craft beers. But the smell lures you in from two blocks away. We had the brisket with coleslaw and pozoles. And we were happy. After that, we met up with Alex and Harriet. Harriet had a plan: she wanted to show us a proper dive bar. The first one Madrone Art Bar on Divisadero served really tasty cocktails, incl. an drink intriguingly called “The Ike Turner”: for 10 USD, you get a 9-dollar shot of whiskey and a slap on the face from the bartender. Very popular, but we passed. Then a dinner at Nopalito, a nice Mexian restaurant that follows a few trends we really like: open kitchen and smaller plates that are easily shared with friends so that you can taste lots of things without getting too full or breaking the bank. Later we had great margaritas at La Urbana, basically a garage next to a popular restaurant, and the only place that did not want to see ID cards on entry (you learn something new every day: we had no idea this would be required and left our passports at home). And where does all this drinking end? In a photo booth, taking stupid pictures of yourself. That’s where it ends, of course. Sunday morning means pastries for us, so we met Alex and Harriet at B Patisserie near Pacific Heights. The kind of place where you have to stand in a long line and than give a procrastinating table the “ahem treatment” and basically intimidate them to leave because that’s how crowded it is. We loved the pastries but still have the feeling that some US pastry shops make a great piece of pastry… and then add some more sugar just to be on the safe side. We were so full we had to walk, so we did. In case you were thinking we are just two mindless food junkies, that’s only partly true: we also visited the de Young museum to see the Keith Harring exhibition and loved both. The Golden Gate park is huge and beautiful. We strolled the park, watched as the locals jogged and rode bikes and exercised, and thought what we would order at Outerlands, our next stop. Oh well. Having walked to Outerlands through virtually the whole width of San Francisco, we signed in and had coffee at Trouble Coffee, basically three hipsters blasting Wu-Tang Clan on the stereo and pulling some pretty good coffee. They introduced us to the “Gibraltar”, which is something we would call a “double-shot cortado” here. Then we walked to see the beach and saw the ocean. Some 45 minutes later, our table was ready. BTW, the classic scent of this part of the town was, in our experience, that of marihuana smoke, but we did smell reefer virtually throughout the entire city. Although we visited Outerlands for brunch, it was the best meal we had throughout our entire week in San Francisco. The duck soup was incredibly rich and fresh at the same time. We sat right next to the expediting table and were amazed at how organized the kitchen was. It is out of the way but we would be happy to return there any day of the week. After the brunch, we decided to take the bus back to Mission and had the salty caramel ice-cream at Bi-Rite Creamery. Clearly a popular place and for good reason. Let us just say one thing: we are really glad Jan’s mom, an ice-cream fanatic, doesn’t know about this one. Her head would probably explode. From there, we continued down the street, bought half of bread at Tartine and ate it nearly all on the spot just with butter, which meant no dinner later on. Our last day in San Francisco proper started by another walk through the Ferry Building. That is another place that Prague misses - a building that would unite more local high-quality vendors like Torvenhallerne in Copenhagen, for instance. We went for a quick lunch to the Slanted Door. If it was recommended by Evan Rail, it has to be good, right? Again, this is a place that should be a model for the Prague Vietnamese food scene, especially when it comes to appearance and presentation. And the food was good and fresh, and because the Ferry Building is one of the piers, it had a view of the bay. What’s not to like? Because we planned to drive to LA from San Francisco, we got the car one day earlier to visit Napa Valley and Sonoma Valley. Napa is beautiful but compared to other wine countries we have visited, it does seem slightly “domesticated” and a wee bit touristy, with the main road in the middle, the buses, the wine train and so on. We did stop at Yountville to see the French Laundry and their “farm” right next door. Seeing the produce they grow there, we did question why we have not booked a table, but then we remembered: “oh yeah, it’s also pretty pricy”. That said, Thomas Keller clearly has a vision and no wonder he is an inspiration to many. We did buy some goodies at his Bouchon Bakery in the middle of the town, though. Sonoma was much more similar to what we are used to here: small, windy roads going up and down hills and great views behind every corner. We had two wine tastings: one at Copain Wines, which included a small cheese board of local cheeses and charcuterie and was limited to six people per group. We have no idea why more people don’t do events like this here in Prague. The second winery was the Lynmar Estate, a winery that housed an entirely beautiful vegetable and herbs garden. We spent long minutes there, since they told us we could pick anything, and their “anything” included small forest strawberries, a think Zuzi absolutely adores. Then we talked to one of the staff there, a former opera singer who lived in Germany for nearly two decades. That is the best thing about travel. Meeting people. It was hard to leave. But we had to leave. The next morning we were off to Los Angeles. Heath Ceramics: This is a must. We love their Mid-Century Modern and younger designs. Mill: A fantastic shop with womenswear and accessories in Castro. 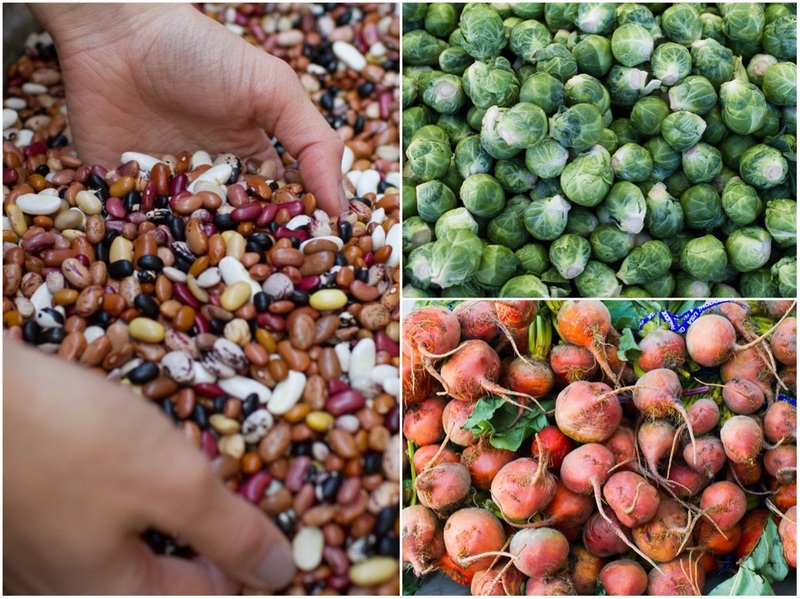 Bi-Rite Market: A small chain of co-op groceries focusing on local producers. Ferry Building: A market for every day and every occasion. Farmers' market outside on Saturdays. Rare Device: Cool accessories and things. Press Works on Paper: Wonderful bookstore with beautiful books and print art. General Store: A lovely store with fashion and home accessories on Judah street. Don't miss their beautiful backyard. Unionmade: A well-stocked and curated shop of men's fashion. The male version of the Mill shop. March: Designer kitchen accessories, cookware, furniture and home accessories? Yep, they have them aplenty. The Perish Trust: A "modern-day general store" curated by artsy owners on Divisadero Street. Reliquary: A store fully stocked with women's fashion accessories. Dandelion Chocolate: San Francisco chocolatier that lets you buy... and taste all their products. Now with hot chocolate! We closed the 2014 summer season and left to the USA for the entire month of November. This is what we did.